How do you think about art? You just start thinking. I’ve had the pleasure of spending a year in thoughtful art practice with Eve Chayes Lyman and others. This article explores a small sample of Eve’s art and what I think about when I view it. Eve Chayes Lyman is an accomplished artist. Her photography is deeply concerned with humanity and human environments, often focusing on color and texture as reflections of our shared experience. Her lens travels, much of her imagery is taken in Afghanistan, North Africa, and Latin America. The dynamism of her Arab Spring images — from Cairo, Morocco, and Tunisia — are as rich as her documentary-style views into the lives of others. Complimenting her talents at photography, Eve has a body of drawn and painted figures that simultaneously explores and exposes the human form. Prolific and impassioned, each piece is a window opening into its own reality. “The art I make is perhaps a result of all my thoughts,” Eve wrote to me, “but when I make art, I never think. I find her work evocative of Egon Schiele. But unlike Schiele, whose figures were freed by hard lines and angles, Eve’s portraits are liquid, almost lyrical in composition — a feminine counterpart to Schiele’s masculinity. 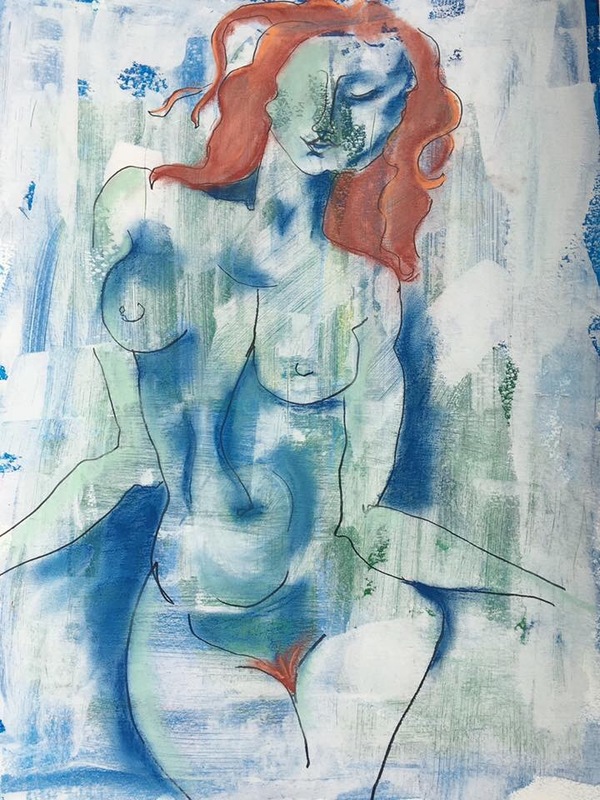 Blue Moon, for instance, flows like an aerial view of a river delta, the florescent ink creating blooms that form into a proud display of the feminine body. The divot of the subject’s hip may be one of the most divine aspects of the piece and, true to style, highlights the unique beauty of imperfection that is so characteristic of her works. Indeed, Eve’s subjects are most masterful when she allows her hand and the media to drive the form of the painting. 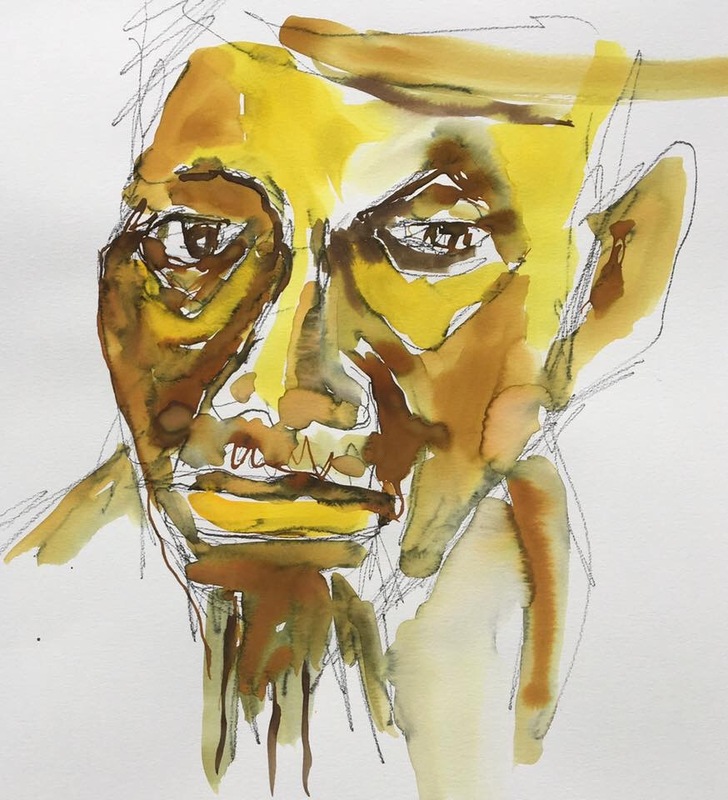 Her yellow and ochre portrait of JJ carries a weight of age and experience in his gaze because she allows her pen to dynamically form the eyes. 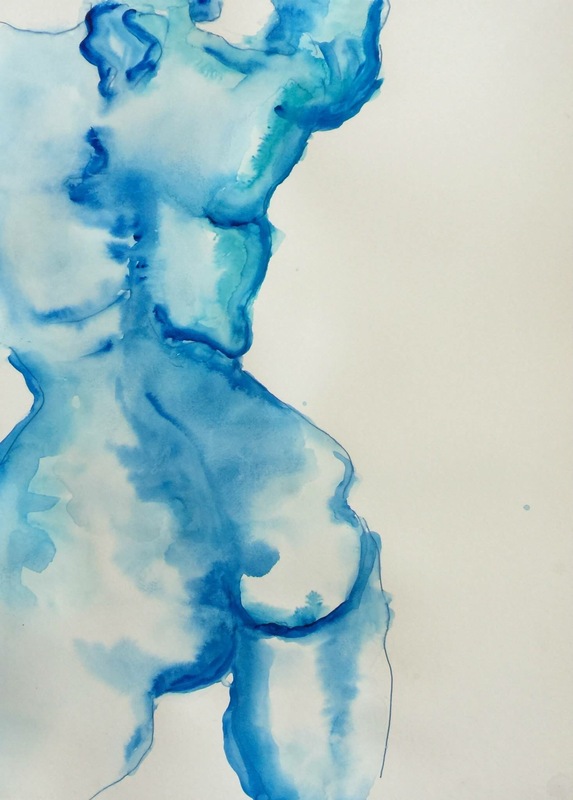 We feel the depth of the piece as the liquid watercolor application meets the layered and staccato swirl of the pen. Experimentation is a vibrant aspect of Eve’s craft. Constantly exploring, Eve works in a variety of media. Fragment, for example, is charcoal on newspaper, Red is pastel on gesso and acrylic ground, and many works incorporate watercolor, pencil, ink, and other textures. Though her paintings vary in media, her consistency in subject and style creates a collection that is both accessible and individual. Within Eve’s art you are capable of finding not only a mirror to your own soul but one that reflects back the heart of what it is to be human. Eve Chayes Lyman is a photographer and graphic artist. Her work has appeared in various publications including Harvard Magazine and Marie Claire and has exhibited in national and international venues. You can presently see Eve’s work at the Neutra Museum in Silverlake. She and I will be showing together at the Canoga Park Youth Arts Center for our pop-up show, Small Groups, November 14-20. Visit her Facebook page for currently available paintings, including those featured here. What a magnificent tribute to you. It is elegant, literate, descriptive and so well-describes what you do and who you are.